Meeha Meeha: DIY Advent Calendar: Igloo Village! The Igloo Village is always in the mood for winter fun. It is made of origami paper, so it's light, small and easy to move around the home. Also, if it survives the holidays and the curiosity of my cats, it could be stored away in a small box, until next year. In theory, igloos are white - but mine are colorful, because when the sun shines across the endless sea of ice, the snow sparkles in soft tones of yellow, blue and even pink! For the countdown to Christmas, I've made 24 little units: 14 origami igloos (in 2 sizes) and 10 paper trees (also in 2 sizes). Each item has its own number written on the side. The village display is random, so you need to find your next number, which adds a little to the excitement. Last but not least, I must tell you that the Igloo village looks great at night time, too! Since it is already pitch black each evening when I come back from work, it is a pleasure to take a peek at my Advent calendar, sitting quietly under the soft glow of a small lamp! If you haven't got an Advent Calendar for this season yet, it's easy to replicate this one. 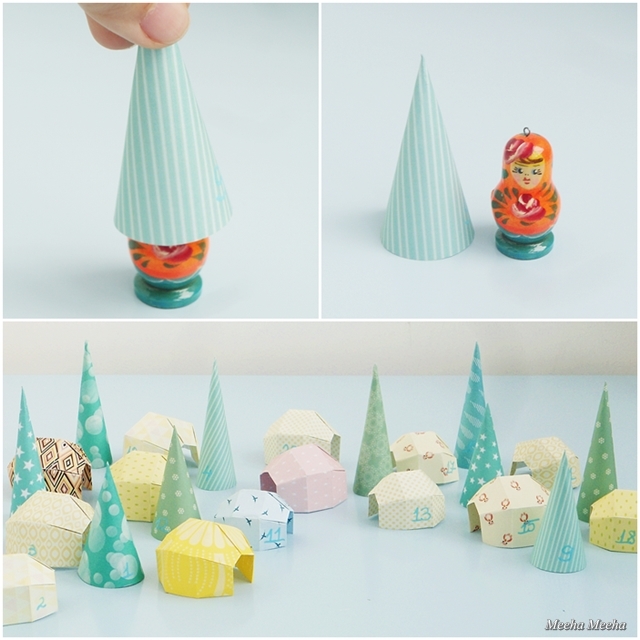 I'm sharing the tutorial below, split in 2 parts: the igloos and the cone trees. It took me 3 hours to make the entire village, but prepare to spend a little more time if you're a novice in paper crafts in general and origami in particular. - origami igloo template: I used this great one from the talented Francesco Guarnieri. - patterned square origami paper. I worked with two sizes: 8.5 x 8.5 cm square sheets and 10 x 10 cm square sheets. - pencil and ruler for marking where you need to fold the paper. 1. Lay the paper square on the blank side. Mark where you need to fold the paper in 5. 2. Start folding the paper in 5 equal strips horizontally, then in 4 equal strips vertically. 3. The folded paper should look like a grid. 4. Fold the extreme strips inside. 5. Fold again and make a little crease just like in the template. 6. Repeat another two times. The paper should look like this. Mark all the valley and mountain folds, for easy final assembling. 7. This is the tricky part: get the valley folds in one hand and flip it on the inside. 8. Carefully press the paper folds in order to make the final shape. 9. Repeat steps 7 and 8 on the other side of the igloo and you're done! - cone tree template: I used these ones but in a smaller scale. - patterned origami paper. The small trees fit into 8.5 x 8.5 cm square sheets and the tall ones fit into 10 x 10 cm square sheets. - pencil and ruler for drawing the template outline and for marking where you need to fold the paper. - scissors and glue stick. 1. Print the template on cardboard and cut it out. I didn't make the round base, just the cone. Lay the template on the blank side of the origami paper. Draw the outline. Be careful not to move the template during the process. 2. Cut out the origami paper, following the outline. 3. Fold the paper along the marked line. 4. Fold again on the other side. Apply glue on the patterned folded strip. 5. 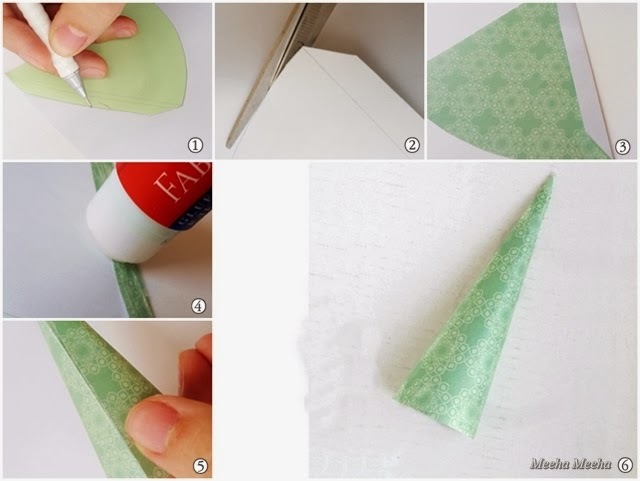 Turn the paper on the good side and put the edges together to make the cone shape. The long edge must overlap the glued strip. Gently press with your fingers until the glue sets in. 6. Enjoy the paper trees and the entire Igloo village! Such a wonderful diy project. It looks so sweet. Thank you, my heart was full of joy when I was making the little igloos! You were so patient making these little igloos, but it was worth it, it's so cute! Thank you, Magali! I've been trying all weekend to put tea lights into the paper igloos, but it just doesn't work :)) If you ever feel like making origami, don't be afraid that it will take a lot of time - just try it and the time will fly away in the most enjoyable way! I never ever made an origami shape in my life, and since I am pretty sure I really can't make any of this, I will be comming to this post to enjoy this village often! Please, Ana, try to make some origami with the children, maybe on a rainy Sunday afternoon! Working with paper is amazing, it is as relaxing as crocheting or sewing! You can start with a simple design and using a big 21x21 cm origami paper... you will see that origami captures you and steals you for hours... but it feels like endless fun! Thank you, Erica! 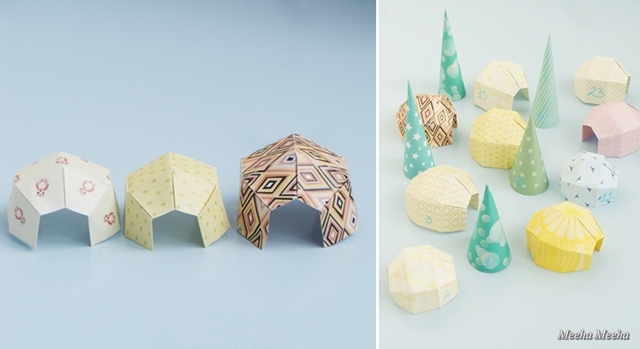 Please don't be fooled by the execution time - if you want to make the origami igloos, time will fly by so quickly! This is the cutest little advent calendar I have ever seen! Pinned it! Thank you for the fun tutorial, I have never tried origami. Your papers are so pretty! Danni, you should try origami at least one time. 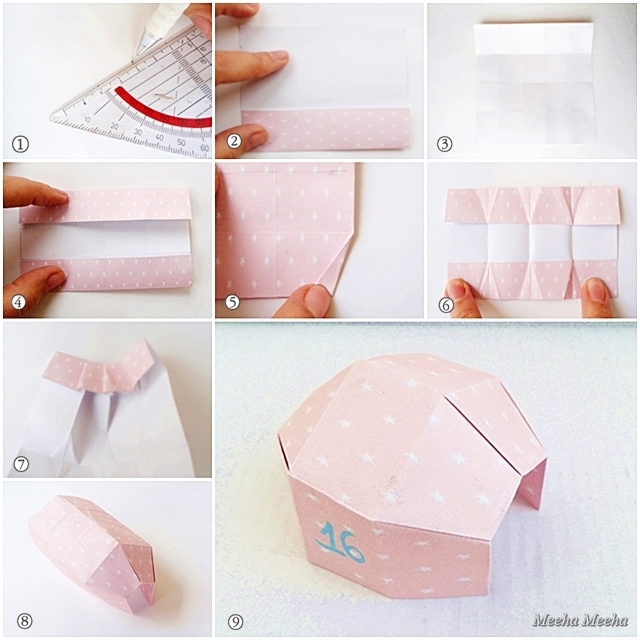 Start with a simple design like a paper boat and use the biggest origami paper that you can find. Contrary to the popular belief, origami is not difficult at all! This is so unique! I absolutely love every detail of it! The color choices are super cool, too! Pinning! Oh this is lovely Meeha! Absolutely lovely! 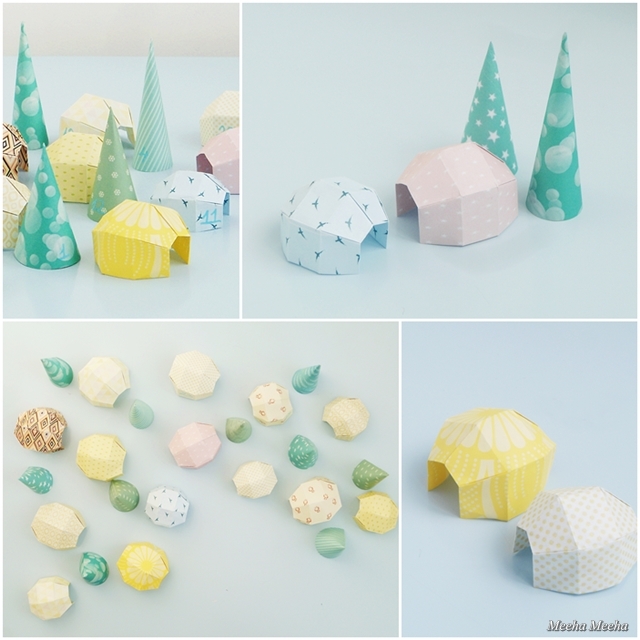 Thank you, Andrea - I had lots of fun choosing the patterned paper and making the igloos! What a lovely, creative idea! Now that we live in Canada, it is a must-do project! How genius of you -- you know, that whole two birds with one stone crafting genius!!! Linda, thank a million for your lovely comment and for the pin - you surely know how to brighten up a girl's day! Wow .. what a creative and funny DIY! :D Very delicate colors on the sweet trees and igloos! Thank you, Lisa! During the weekend all my friends visited me and saw the origami calendar - they are not kids anymore, but I think they liked it, too! Oh my, how cute is this?! I LOVE it :) And my son would love it too. Thanks for sharing, friend. Hugs to you! Thank you, Stephanie! Everyone seems to be frightened by how difficult origami could be - but I discovered origami at 8 years old and I think it's perfect for kids! What an absolutely darling idea! So glad I saw your link-up at Flamingo Toes. I'm pinning your post and promoting a link on my FB fan page! Oh my heavens, this is soooooo cute! Thank you for the kind words, Kelly! Thank you so much for the lovely comment, Tracy! Thank you for visiting, Anna! Origami is not very quick to make, but you don't feel the time passing by, so you should definitely try making the igloos some day! Thanks a million for the pin, Rose, it means a lot to me! Thank you so much for visiting, Shannon! This is beyond adorable. I'm a semi-paper fanatic so your project caught my eye immediately! I'd love for you to link up at our Link It or Lump It party! So clever!! The most unusual Christmas countdown I have ever seen! What a beautiful novel idea. I love it! Thanks so much for linking up to Thriving on Thursdays. I'm featuring this post at tomorrow's party. I just love this will feature tonight at Home Sweet Home! Such a fun and cute idea! So very creative. Thanks so much for sharing at Ivy and Elephants. This is so fun! Thanks for sharing it at Monday Funday. Hope you are doing well! Adorable! I love advent with the kids and new ideas like this are great! Thank you! You've been pinned, followed, and liked! Cute, clever, & creative! Thanks for sharing at Submarine Sunday!! So unique & cool (literally & figuratively!). You've been featured at this week's link party - stop by & grab a Featured On button. Thanks for linking to the Craftastic Monday party at Sew Can Do! I am a complete paper freak so when I saw your advent calendar I was smitten! Just lovely. Thanks for making and sharing it. I gush over all things paper and the lost art of letter writing over at www.ritewhileucan.com I think you may enjoy. So cute!! This would make a great advent! Love this!! Thanks for linking up at Take it on Tuesday. Hope to see you this week! Very very cool!!!!! Absolutely stunning! I suppose I am not going to say anything that wasn't said already here! These are so cute! I love it! I found you from your feature at The Life of Jennifer Dawn. Oh my goodness, this is incredible. I love your unique take on the advent calendar. This is so adorably cute I had to pin it for next year.